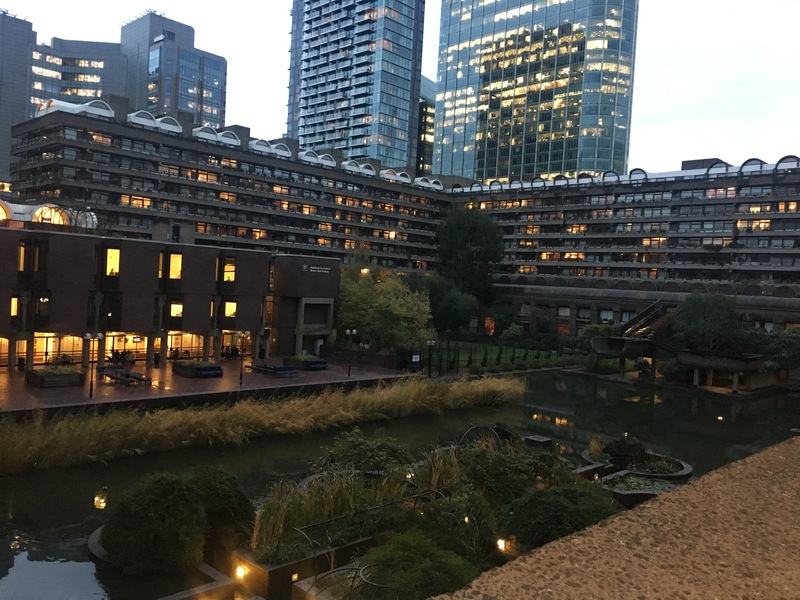 The Barbican is an estate which tends to divide opinion. Built over bombed-out Cripplegate after the Second World War its brutalist style is seen by some as an offensive eyesore and by others an important part of our architectural heritage. The Queen on opening it claimed it was “one of the modern wonders of the world”. The former Guardian critic Jonathan Glancey once described it as “like some great concrete ship that has come to berth in the City of London”. More critically, Prince Charles has also said of it that at least “when [the Luftwaffe] knocked down our buildings, it didn’t replace them with anything more offensive than rubble”. Opinions were also divided within Sketch Club on Wednesday when we came to draw the concrete towers, walkways and water features of the sprawling estate. For some the scale and variety of subjects on offer was overwhelming while others quickly found inspiration and got to work. The simple geometric style of the Barbican made it an ideal subject for practicing the fundamental line drawing and shape forming skills that have been crucial in developing our sketches over the past year. This development continues to be borne out by improvements in the quality of sketches resulting from our visits and this week’s trip to the Barbican was no exception. In particular, Megan’s sketch of the monolithic columns which support the walkways over the Barbican water gardens made impressive use of shade and proportion. After a successful summer, Sketch Club will now be heading back inside for the Winter. The next visit will be to see Tania Bruguera’s new installation in the Tate Modern’s Turbine Hall. Now the content of the installation has been announced (a tennis court-sized portrait of a Syrian asylum seeker which is revealed by body heat when visitors lay down on it) it doesn’t sound particularly sketchable but there’ll certainly be other subjects to inspire around the rest of the gallery.